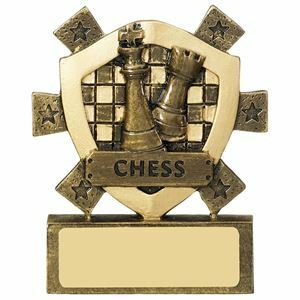 At Impact Trophies & Medals, we offer a great range of chess trophies, medals and awards suited to any chess match or tournament. Our extensive range includes figure top chess trophies, glass chess awards and shields & plaques for chess. Impact Trophies & Medals are a leading retailer of chess trophies & awards. Great for personalisation, many of our chess figure trophies and shields for chess can be personalised with a free self adhesive engraved text plate and printed logo inserts, to perfectly meet all your chess tournament needs. 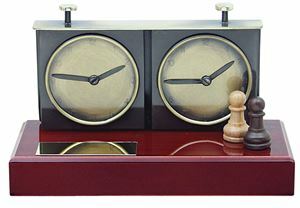 The Micro Chess Trophy features a chess board with 3 golden chess pieces set in front of it. The trophy topper stands on a gold riser which is set on a trophy base with triple star design. The Micro Chess Trophy is made from high quality resin and is coated with a glossy varnish. This Chess Mini Shield is formed from a premium resin and features a hollow shield shaped frame highlighted in gold with a bronze chess board and chess pieces set into the centre. The award is set on a small rectangular plinth with space for personalisation and is glazed for a quality shine. The Mini Star Chess Trophy is the ideal way to celebrate success in a chess tournament. 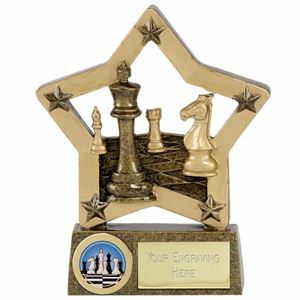 Made from resin and coated for a high shine finish, this small trophy features a series of chess pieces set in front of a golden star. Showcasing a bold image of three chess pieces; a black knight, a black king and a white queen, this attractive award would be suitable for any chess presentation. Printed on to high quality acrylic, the image is surrounded by a golden frame and is topped with a red CHESS banner. The star shaped plaque is supplied with a black plinth, the two designed to easily click together. 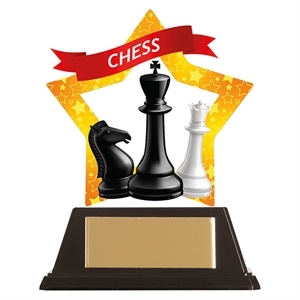 The Mini-Star Chess Acrylic Plaque can be personalised to meet the requirements of your event. 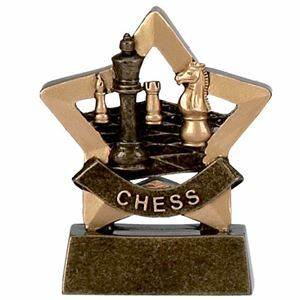 The golden Star Chess Award is a star shaped trophy surrounding a chessboard and several chess pieces. A dark king stands proud surrounded by a golden knight, bishop and rook. Made from glazed resin and standing on a rectangular trophy base, this small chess trophy is perfect for any chess match winner. The smallest size available in the Typhoon range, the Typhoon Chess Trophy offers great value for money. 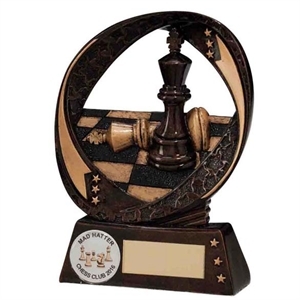 Showcasing a chess board and pieces surrounded by an oval band decorated with stars, the trophy is made from a quality bronze varnished resin and is decorated with stars. This wooden plaque is made from a quality wood, veneered in a polished mahogany effect coating and supported by a photo frame style mount to the rear. Finished with bevelled edges, the Maverick Apollo Chess Plaque displays a quality glossy gold and bronze plastic emblem depicting a chessboard and two chess pieces, framed by two oval decorative hoops. There is space at the bottom of the rectangular plaque for personalisation. Cast from a premium grade plastic, the Maverick Legend Chess Trophy is set on a solid cream marble base and showcases two chess pieces and a chequered chess board surrounded by two oval shaped rings. The trophy is glazed in a high shine two toned bronze varnish and offers exceptional value. 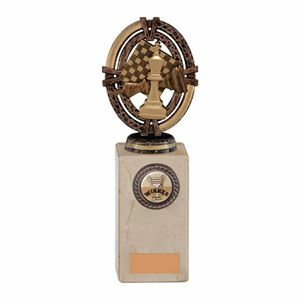 The Round Chess Award is made from premium quality resin with a lacquered gold and bronze finish. The award features a round gold rimmed disc showcasing glossy gold and black chess pieces against a bronze background. Set on a slim wedge shaped base, the award includes a round frame which can display a club logo, with space on the base for an engraved plate. The Maverick Legacy Glass Chess Trophy features a quality lustre two toned bronze coloured plastic chessboard and two chess pieces. The premium crystal plaque is made of 5mm thick jade toned clear glass with bevelled edges. The Typhoon Chess Trophy is made from a superior grade resin coated in a burnished bronze effect. The trophy features two chess pieces set on a chequered board at the centre of an oval hooped frame. Finished with gold accents and decorated with star motifs, the trophy is lacquered for a gleaming shine. 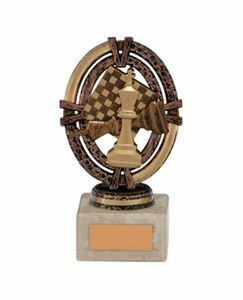 The Maverick Legend Chess Trophy features the image of a chequered chess board with two chess pieces, within an oval ornate frame decorated with embossed stars. Made from a superior grade plastic, the trophy is finished in an antique bronze glaze and is mounted on a cream, solid marble plinth.